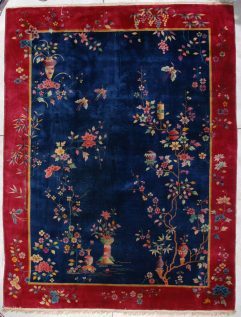 This circa 1930 Fette Art Deco Chinese rug measures 2’0” x 5’0” (60 x 152 cm). 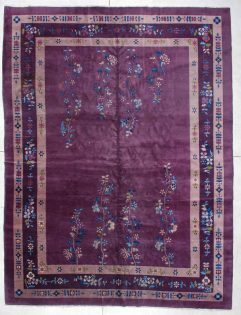 It depicts the eight Daoist immortals who are credited with knowing the secrets of nature flanking Shoulao, the God of longevity. He is seated with a crane which represents immortality. They all stand on clouds to symbolize the celestial realm. They were believed to be able to raise the dead, make themselves invisible and to bless anyone who bore their image. 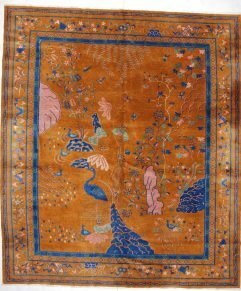 The rug is on a black ground with Chinese pictograms in peach, purple, orange, blue, and green. 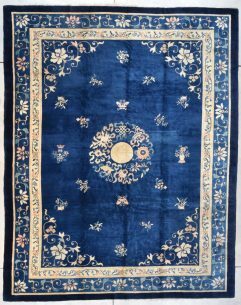 The rug is in mint condition. The buyer pays the shipping and insurance of $50.